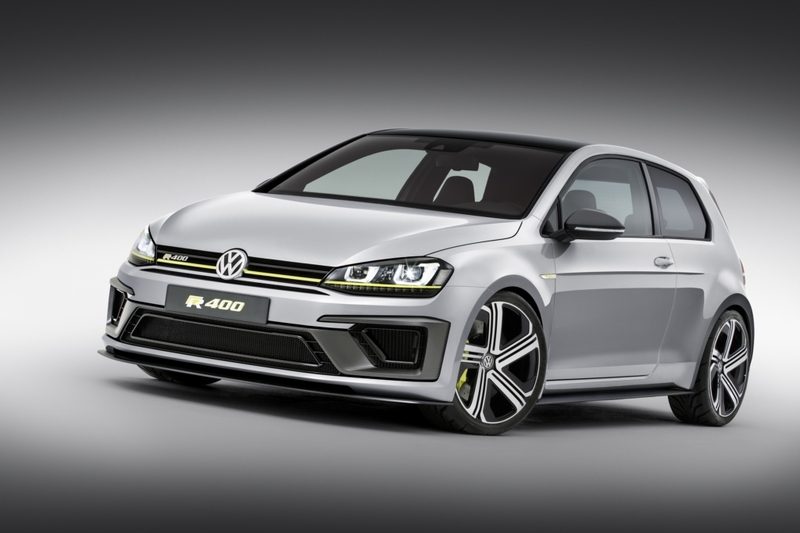 After making its global debut at the Beijing Auto Show earlier this year, Volkswagen of America is presenting the exciting Golf R 400 concept car for the first time in North America at the Los Angeles Auto Show. Developed by R GmbH, the Golf R 400 concept shows just how far the Golf R can be taken using the experience gained from VW’s involvement in World Rallycross (WRC). The “400” in the name refers to the vehicle’s 400 PS (394 horsepower) 2.0-liter TSI® engine, which propels the car from zero to 62 mph in 3.9 seconds and on to an electronically limited top speed of 173 mph. 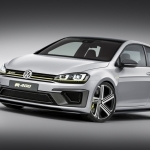 The Golf R 400, including its all-wheel drive system, weighs just 1,420 kilograms (3,130 pounds) thanks in part to its compact high-performance engine and lightweight dual-clutch gearbox. Its weight-to-power ratio is a stellar 7.72 pounds per horsepower (3.55 kg per PS). The 4MOTION permanent all-wheel drive system is one of the most fuel-efficient systems of its kind and the Golf is also exceptionally aerodynamic, even in R 400 form. The car is painted in "Silver Flake" and features a glossy black roof, carbon-look front splitter, and genuine carbon mirror caps. Inside, additional carbon accents further reiterate the Golf R 400’s sporty nature. 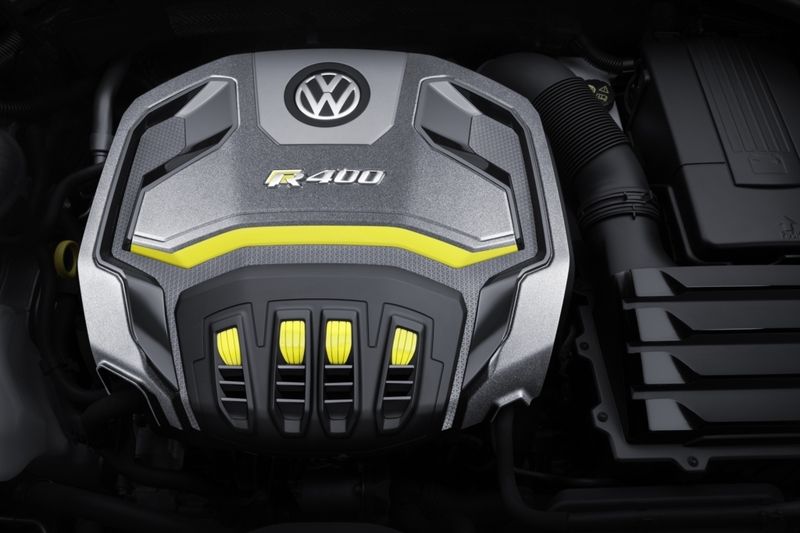 The Golf R 400 is powered by a 2.0 TSI four-cylinder engine with the technical genes of VW’s WRC racing engine. Compared to the 292-hp engine in the production Golf R, the Golf R 400 develops more than 100 additional horsepower—394 hp, delivered at 7,200 rpm. The specific power output of around 200 hp per liter is on the same level as a supercar’s. The engine's maximum torque was increased to 332 pound feet, up from 280 lbft, available between 2,400 and 6,000 rpm. In this car, the 4MOTION all-wheel drive system is coupled with a six-speed manual transmission. The all-wheel drive system, which features a Haldex-5 coupling, is activated even before slip occurs. Under low load conditions, or during coastdown, the front wheels handle most of the propulsive power, while the rear axle is decoupled, saving on fuel. If necessary, the rear axle of the Golf R can be variably engaged in fractions of a second. This is done by means of the Haldex coupling that is activated by an electro-hydraulic oil pump. Along with the Haldex coupling—which acts as a center differential—the electronic differential locks (EDS) integrated in the Electronic Stability Control (ESC) system act laterally. In addition, the Golf R 400 is equipped with the XDS+ system on both the front and rear axles, which brakes the inside wheels and optimizes steering response. The Golf R 400 also has an "ESC Sport" function like that of the production car, activated via a two-stage switch on the center console. When the driver presses the button briefly, the "ESC Sport" mode is selected. When engaged in spirited driving in this mode, the ESC does not intervene as frequently. If the ESC button is held down more than three seconds, “race mode” is engaged, designed for high-speed track driving. The production Golf R’s sport suspension, which is lowered by 0.8 inches compared with a regular Golf, did not have to be changed for the Golf R 400. In front, the two Golf Rs each have a strut-type layout with lower control arms, with a multi-link suspension at the rear. The aluminum-alloy wheels of the Golf R 400 are based on the 19-inch "Cadiz" production wheels, but they were highly modified and equipped with high-gloss black inserts which are designed as air vanes to help to cool the brake system. Like the production Golf R, the tires are sized 235/35 R19. 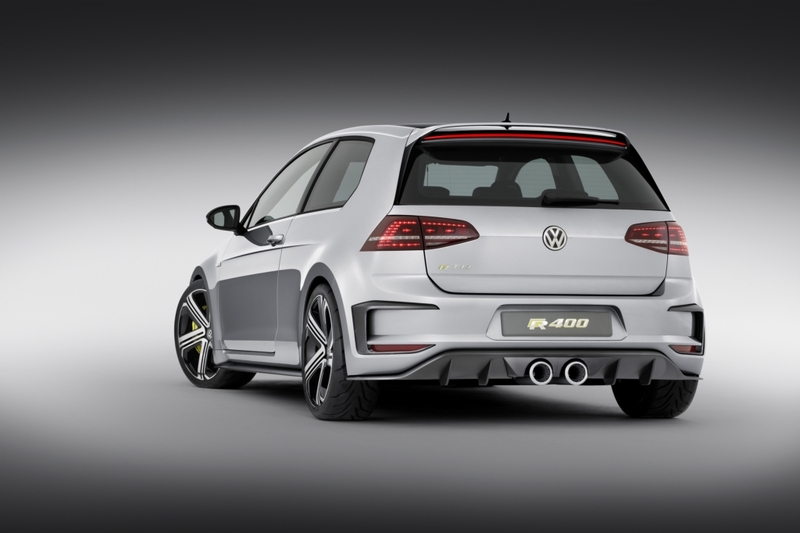 Volkswagen Design made wide-ranging changes to the Golf R 400. The body was widened by 0.8 inches on each side to accommodate the 19-inch wheels that are further outboard due to their larger wheel offset. In front, the designers developed an entirely new front bumper, which—harking back to the Rallye Golf G60 of 1988—is significantly flared. Similarly, the rear fenders were also flared over the wider rear wheels. In addition, the lower sides of the car are characterized by a wrap-around splitter made of carbonfiber that doubles as a motorsport-style aerodynamic element. 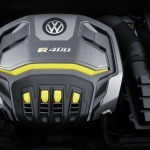 Beneath the high-gloss black radiator grille with "Lemon Yellow" accents, there’s a slot that serves as an air intake to address the Golf R 400’s elevated cooling requirements. On the bumper, the central air inlets are surrounded by C-shaped wing-like elements with high-gloss black inserts. Nestled between these design elements is a protective screen whose honeycomb structure—like so many details of the Golf R 400—is reminiscent of motorsport vehicles. There is also a motorsport-style splitter at the front, with a cabonfiber look. At the rear, the wrap-around motorsport splitters transition into a diffuser that protrudes slightly from the body. 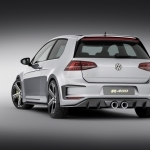 Two exhaust tailpipes are integrated into the diffuser, recalling the Golf R32—the original R-series model that debuted in 2002. However, in the R 400, the inside of the tailpipes has a honeycomb-look that ties in to the design on the front of the car. The rear bumper has been redesigned with C-shaped carbon inlays at each end, with a reflector in the lower horizontal part of each inlay and the vertical part protruding slightly. The designers have also worked in wheelarch exhaust vents. On top, the black roof transitions into a roof spoiler with an integrated LED light bar. 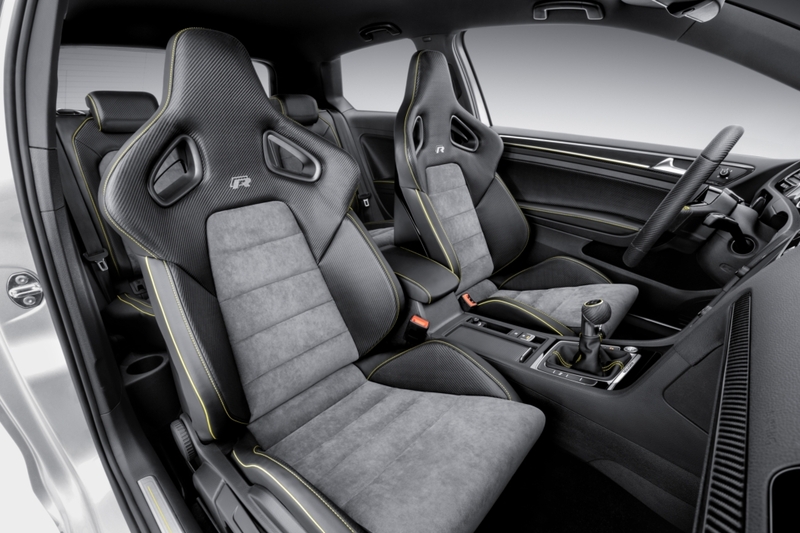 Inside the Golf R 400, the driver and front passenger have motorsport-style bucket seats with integrated head restraints, openings for seatbelts, and “R” badges embroidered on the back. The cross-quilted middle seat panels are finished in Anthracite colored Alcantara; the seat bolsters, headrests, and lower lateral supports are covered in ex clusive "carbon leather". The divided rear seats also have carbon leather outer areas, with Alcantara seating surfaces in the center. Carbon is used as the dominant material for accents in the doors and on the passenger's side of the dashboard—in contrast to the exterior, however, it is glossy rather than matte clearcoat. The center console accents, cockpit surround and trim around the air nozzles are designed with a glossy “Piano Black” piano. Contrasting stitching in the car’s signature yellow accent color is used also throughout the interior. There is white ambience lighting around the door accents and the stainless steel door sill plates. Founded in 1955, Volkswagen of America, Inc., an operating unit of Volkswagen Group of America, Inc. (VWoA) is headquartered in Herndon, Virginia. It is a subs idiary of Volkswagen AG, headquartered in Wolfsburg, Germany. VWoA’s operations in the United States include research and development, parts and vehicle processing, parts distribution centers, sales, marketing and service offices, financial service centers , and its state-of-the-art manufacturing facility in Chattanooga, Tennessee. The Volkswagen Group is one of the world's largest producers of passenger cars and Europe's largest automaker. VWoA sells the Beetle, Beetle Convertible, CC, Eos, e-Golf, Golf, Golf GTI, Jetta, Jetta SportWagen, Passat, Tiguan, and Touareg vehicles through approximately 649 independent U.S. dealers.